Netivat Sofrut: diary of a Soferet: KOSHER or PASUL? 1) Anything that makes it impossible for a 13-year-old boy or 12-year-old girl to read any letter in a Sefer correctly, with difficulty, or not at all renders that Torah pasul (not kosher). 2) Tears at the top or bottom of the parchment render the scroll unfit until they are repaired - unless the tear runs through more than 5 lines of the text. If this is the case, you must geniza the whole thing. 3) If the Sefer Torah does not have the Halakhically required 11 large letters, 6 small letters, 250 petuchot (open paragraphs) & 379 stumot (closed paragraphs), it's unfit & must be put away. 4) If the scroll has one or more missing or extra letter(s), it's pasul. 6) Only Katav Ashuri, the "Syrian" or "Square" script used since Ezra the Scribe, is allowed. Note: Samaritans still use the pre-Ezra Katav Ivri, "Hebrew" script, but we don't use their Sifrei, & it's ok for them. 7) When a seam is torn or has broken stitches, it is pasul until this is repaired. 8) If part or all of a letter's ink has broken away but the stain left behind where the ink used to be is dark enough for a child to read, it's still not kosher & must be re-inked before it's publicly read again. 9) A Sefer written with sub-standard d'yo/ink, particularly the type that sheds dust each time it's used, has to be buried. The text is constantly fading & obscuring itself. This type of "d'yo"is made in the USA by sofrim trying to make a buck. Generally in Brooklyn. 10) When a hole appears inside the inked part of a letter, you can't patch it from behind as all words must be written on the same piece of parchment. To make it kosher you must cut the word out & re-write it on a new piece of parchment, gluing it in place from behind (only kosher glue, please). My other sofrut top 10s are here & here. 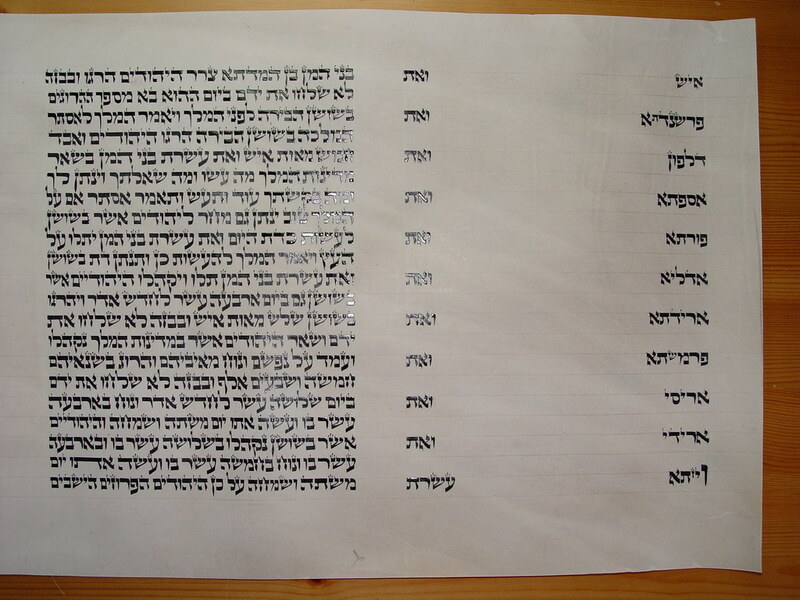 Technorati tags: religion, Judaism, Torah, Canada, journal, weblog, blog, diary, kosher, soferet, sofrut, scribe, art, Technorati. posted by Soferet | 12:47:00 a.m.
Why the emphasis on the age of the reader in points 1 & 8? Could you explain? Point 1 - Girls of 12 years or older & boys of 13 years or older are considered adults according to Jewish law. Point 8 - there are instances when determining the kashrut of a Sefer Torah when one must call on a small child (not, say 11 1/2 or 12 1/2 years old) to name a questionable letter. You cover the letters all around the one of doubtful kosherocity & whatever they say it is, that's what it is. So the scroll may be kosher or pasul depending on what the child says. For #1 -- I know that, but that doesn't answer why the emphasis. If a 9-yr-old who could otherwise read Hebrew easily and perfectly had trouble making out the letters in the sefer Torah, that wouldn't indicate anything as to the Torah's fitness? There are some Sefer Torah kashrut issues that adults (traditionally males) are left to decide. Others are left to a katan, or a child under the age of majority. Some katanim (male plural) are considerd old enough &/or educated enough to tip the scale on a question of whether a particular Torah is kosher, even though he is not kosher to write one because he is not obligated mi'doraita/by the Torah until after his 13th birthday. There are also some instances when a very small katan only, having reached the age of chinuch (3 years old), is allowed to pronounce the name of a letter in question. If he says it's the letter it's supposed to be in the text, then the Sefer is kosher, if he names a different letter, then you have to put the scroll away for repair (there are multiple opinions on this - I'm not stating one hard & fast rule). OK...I'm sorry if I'm being thick, here, but you only seem to be explaining why some situations call for a really young child (which, as I said, I think is really cool). You even emphasized that in some of these instances, even an older katan can pass judgement, even though he's not yet allowed to write a kosher sefer Torah himself. But if that's the mindset that we have when evaluating a Torah's fitness -- that some things are so simple and straightforward that it's children, without external influence political or otherwise -- who are more qualified to decide the matter...what types of doubts are designated only to halachic adults to decide?